WhatsApp just surpassed 300 million users worldwide. In the last four months alone, the mobile messaging app has acquired 100 million users. Users are also now sending 11 billion messages per day, up from 8 million daily in April. WhatsApp has recently made a concerted effort to attract new users from emerging markets. For example, it has offered residents in Southeast Asia an option to pay a small fee for a data-light version. This allows low-income mobile users to circumvent monthly carrier data fees. The app is free on most platforms, but charges users 99 cents after one year of use. This business model draws consumers in. The fact that there’s no distracting ads helps WhatsApp retain users. WhatsApp founders have famously said they’re anti-ads and will never include them in the app. WhatsApp has overtaken China’s immensely popular WeChat, which has an impressive 300 million registered users but only about 195 million that are active. It is also ahead of Line (200 million users), Viber (200 million), and even Skype (280 million). The large user numbers across services are a clear signal of the overall popularity of OTT (over-the-top) messaging (messaging that goes over the Internet via data connections rather than carrier-controlled networks), and its staying power. OTT messaging threatens cell carriers, who lose voice and text revenue, and social networks like Facebook — which have not been able to maintain control of the messaging market. drag2share: Why Millionaires Are Lining Up To Help Students Pay Off DebtHow does it work?What’s in it for the backers? Upstart, a company aimed at helping college students-turned-entrepreneurs raise funds for business endeavors (and pay off lingering student debt), is barely a year old and already has wealthy entrepreneurs lining up to give young people a leg up. They must be doing something right. Since launching in November 2012, more than 200 backers have made 1,000 unique investments in Upstart projects. Of the 120 Upstarts on the site now, about half have been successfully funded. L.A.-based entrepreneur Tony Safoian was an early supporter of the site. He’s run his own successful cloud computing and IT consulting firm, SADA Systems, for over a decade, working closely with Upstart’s founders back in their Google days. After passing a rigorous background check, would-be entrepreneurs build a fundraising page with their business proposal and credentials laid out, just like an artist might raise funds on Kickstarter. Then, the site’s cache of “backers” (i.e. investors) have their pick of the litter. Investments start at $100, and backers can fund however much or! little they’d like. On the flip side, Upstarts can also deny investments from backers if they choose. What sets Upstart apart from other crowdfunding sites is the option backers have to also offer themselves up as a mentor. 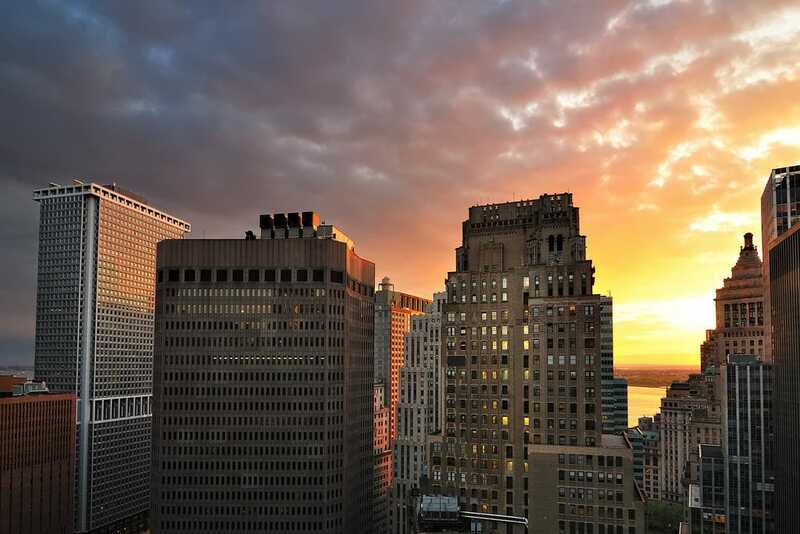 For the vast majority of small businesses — the ones away from New York and Silicon Valley and in industries like dentistry and auto repair — getting financing is a massive pain. It involves reams of documents, weeks of waiting, and frequent rejection. New York startup On Deck Capital hopes to appeal to these millions of businesses with a loan application process that takes minutes to complete and can be approved within a day. On Deck’s secret is software that evaluates loans within minutes based on analysis of data including cash flow, past credit use, and vendor payment history. While banks look closely at a business owner’s personal history, the startup makes decisions based on data about the business itself. At the same time, the startup is efficient enough to deal with small clients. He believes we’re going to carry around a single device that powers all our other screens. That since device is going to be a smartphone in his opinion, and therefore tablets are going to be totally irrelevant. To which, we present this chart from Dan Frommer. 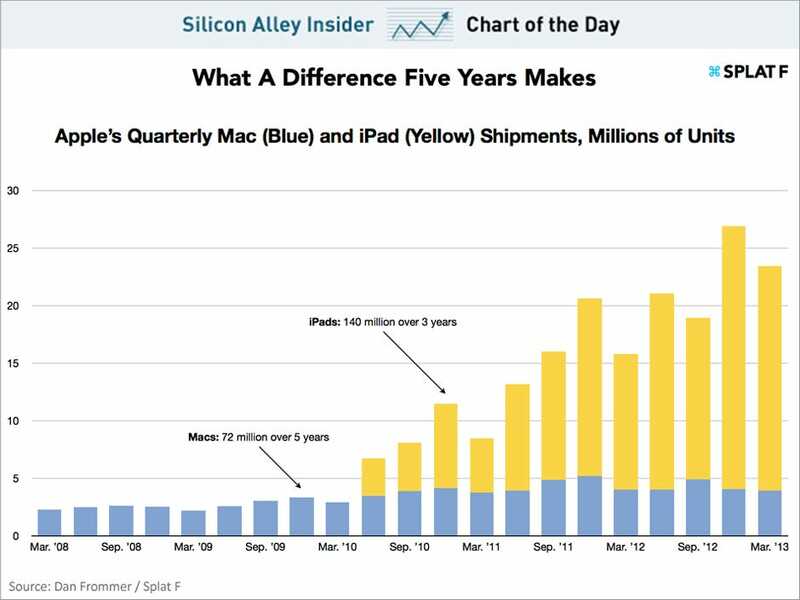 As you can see, through three years the iPad has sold 140 million units, almost double what Apple has done with the Mac. Perhaps the wheels fall off this thing, and it disappears from existence in five years. We doubt it. The reason the iPad sells well, despite being slightly redundant, is that people like to have dedicated gadgets. People don’t want one device to power everything. – Pinterest does not own or have ANY content — all of the content is linked to and served by other content owners, who could decide to disallow Pinterest’s further use of the content by blocking hotlinking. 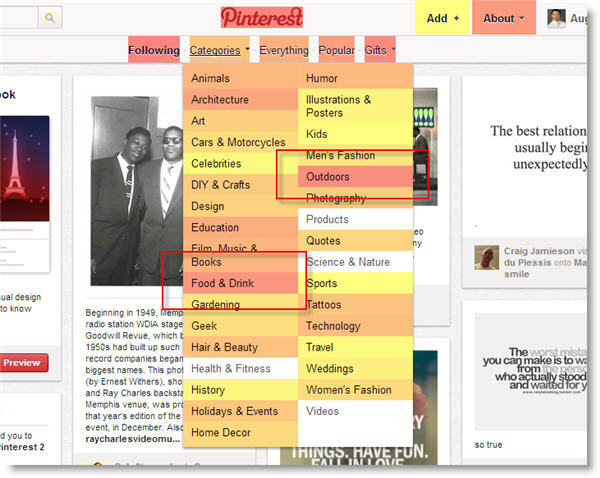 NOTE: The point is that Pinterest may not find a real business model and revenues may never amount to much. But this does not mean that it won’t be bought by some other larger company that wants access to its user base and their activities on the site for other purposes such as ad targeting. LinkedIn reported earnings last night, and one thing that jumps out is its revenue growth rate, which is sky-high compared to Facebook. As you can see here, LinkedIn’s year over year revenue growth rate is 89%. Facebook, on the other hand, is 32%. LinkedIn’s absolute revenue is much smaller. We’ve also plotted it below. 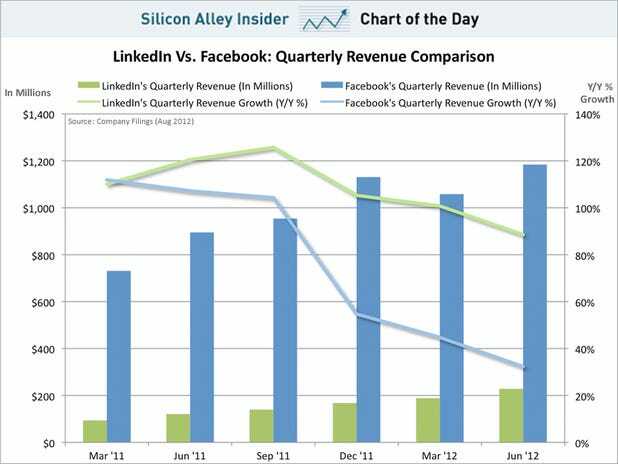 LinkedIn is reporting stronger growth than Facebook because it’s not as ad dependent as Facebook. LinkedIn has subscriptions, advertising, and job listings. Those three revenue streams help its growth. It’s also growing at a greater clip because LinkedIn is coming into its own now. While LinkedIn is an older site than Facebook, it’s taken longer to mature. It seems to have figured out a great business model. Facebook investors, the one’s still hanging onto the stock, are betting that Facebook will figure out a better business model in the long run too. Here’s an interesting look at how the platform wars are playing out across smartphones and tablets. 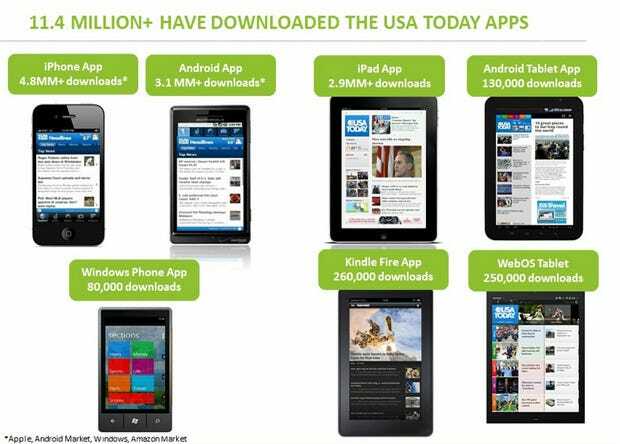 GeekWire landed an internal slide from USA Today that lists how many times its application has been downloaded. USA Today has a wider, more geographically diverse readership than most other newspapers, giving us insights into the ecosystem that we might not get from the typical measurement companies. If USA Today’s internal statistics are any indication, the Kindle Fire is blowing other Android tablets out of the water. The slide shows 260,000 downloads of its app for Kindle Fire compared with only 130,000 for other Android tablets. That’s a two-to-one ratio. The Kindle Fire still trails the iPad by some ~2.6 million downloads, but that’s unsurprising. What’s more impressive is how much headway the Kindle Fire has made in the short time since its release. Further, you can see that the iPhone app is still beating the Android app in downloads. And Windows Phone has a lot of work to do. 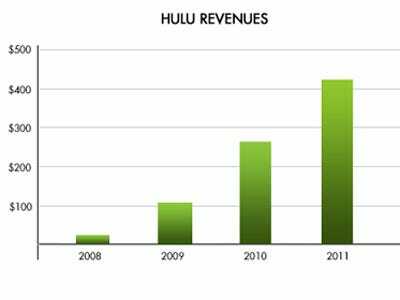 Hulu CEO Jason Kilar just revealed some big numbers from 2011 on the company’s blog. The web video startup generated $420 million in revenue, up 60% from the year prior. Hulu Plus has 1.5 million paying subscribers and is gaining at double the rate it was last year. It reached 1.5 million faster than any other video subscription service. Since 2010, Hulu’s content offering has grown 40% and Hulu Plus’ has grown 105%. Hulu’s business model allows them to compensate content providers 50% more per subscriber in licensing fees than its competitors. 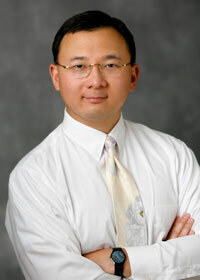 The service plans to invest $500 million in content in 2012. Fab and Turntable weren’t the only pivot success stories of 2011. Another e-commerce site, OpenSky, went from struggling to successful in about nine months. OpenSky was founded in 2009 by John Caplan as an e-commerce arm for bloggers. Influential writers could create storefronts alongside their content, but it wasn’t a fruitful business model for OpenSky. Caplan decided to pivot his startup. OpenSky relaunched in April as a personalized shopping site. Now e-commerce isn’t secondary to content on OpenSky; it’s king. The new OpenSky operates like Twitter. It works with 80 industry influencers and celebrities, like Martha Stewart, Bobby Flay and Alicia Silverstone, to create lists of their favorite items. Users can follow the influencers and buy the endorsed products. OpenSky holds all the inventory, ships items to users, and splits the profit 50/50 with influencers. 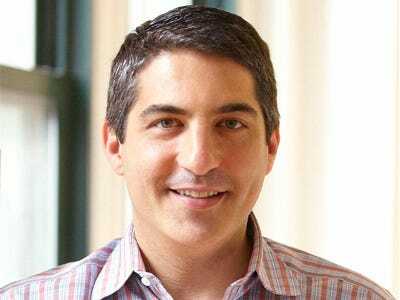 Caplan says none of OpenSky’s influencers are investors. They just really like the product. “It’s like Twitter but our merchandisers [the celebrities who pick the items OpenSky sells] are making tens of thousands of dollars every month from their followers,” says Caplan. Martha Stewart, for example, has 83,549 followers on OpenSky just waiting to buy a recommended rolling pin or mixing bowl. So far, OpenSky’s pivot has worked wonders. In April, its first relaunch month, OpenSky generated about $66,000 in sales. Last month it generated well over $1.5 million. “Revenue has been increasing 50% month over month,” says Caplan. In October the 87-person startup raised $30 million. Today, Caplan told us OpenSky crossed the 1 million user mark. About 68% of users are repeat buyers, purchasing new OpenSky items within eight weeks. We asked Caplan what his margins are like. Despite the 50/50 split, he says they’re pretty good. “Brands are excited about OpenSky because they want to be endorsed by celebrities,” says Caplan. While brands can’t pay for distribution on OpenSky, they generate a lot of sales when celebrities decide to post their items. Caplan likens OpenSky to Pinterest. The brands’ excitement makes it easy for OpenSky to purchase, store and sell celebrity-endorsed items at reasonable prices and margins.